In the FIRST Robotics Competition (FRC), students are challenged to build a 120-pound robot in just 6 weeks. This year, teams journeyed to Deep Space, building robots capable of efficiently lifting and transporting cargo to space shuttles before the arrival of the next planetary sandstorm (read: in two and a half minutes). Although it may seem that the skills required to build a robot are purely technical, the true magic of FRC lies beyond the flashing lights. FIRST teams are building more than just robots. They are building the necessary skills to become future leaders in STEM. In collaboration with Microsoft Canada, we went behind the scenes at the FIRST Robotics Competition hosted by Ryerson University to learn more about how FRC is setting young people up for success. By speaking with participants and cheering on our favorite robots, we experienced firsthand how companies are building future STEM leaders and enabling teams to Do More Together. Within minutes of the competition kick off, we were absolutely blown away by what we saw. The energy was electric (pun intended) as two Alliances of three teams faced off to win the most points in a match. Students were enthusiastically manoeuvering their robots, collecting cargo and blocking opponents, all while making strategic team choices based on how their robots excelled. Alliances are a unique approach to competition that embody the FIRST value of CoopertitionⓇ, which is described as “competing always, but assisting and enabling others when you can”. While teams individually compete for rankings, they earn points in matches by collaborating with two other teams, who they may not have met before the competition day. The concept of Alliances is familiar to us. In our engineering roles, collaboration and problem solving are key to success and it is common to meet contractors or clients for the first time on a job site. Cultivating these skills hands-on not only prepares students for leadership roles within their FIRST teams, but also for future leadership roles in STEM industries. Building a robot in 6 weeks is no small feat. In addition to the dedicated students and mentors that conceptualize a space rover, it takes financing to make their designs come to life. This is where companies can have a direct impact on a team’s success and development. At the Ryerson Competition, we spoke with three teams whose participation in FRC was thanks to sponsors like Microsoft – teams 5031 “Full Metal Mustangs”, 5719 “Pink Titans”, and 746 “Gearheads”. 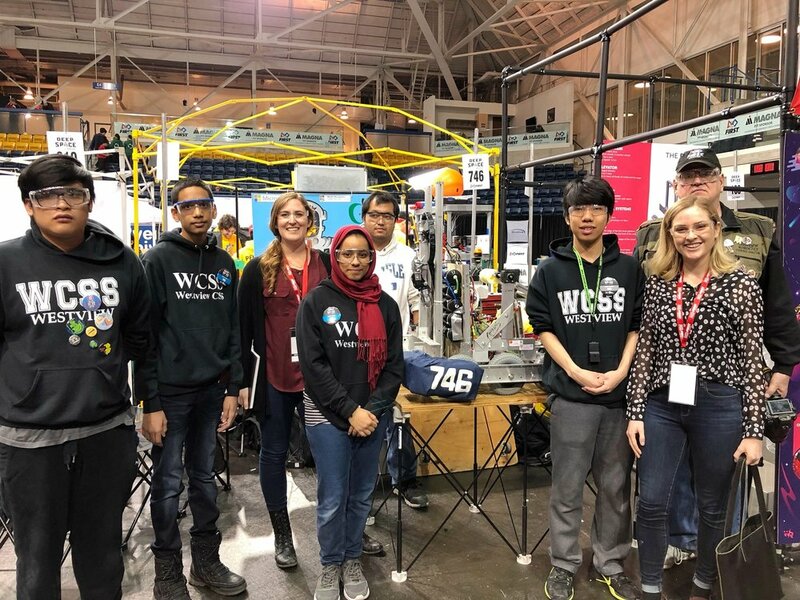 Team 746 comprised of students from Westview Centennial Secondary School in the North York suburb of Toronto ended up ranking fourth after the qualification matches. The team was excited and their scout was busy checking out the other teams to prepare for the finals. The team’s operator, Ibty, showed off their robot’s best feature (the hydraulic lift) and explained how she controlled the robot’s arms to load cargo. Ibty has aspirations of pursuing mechanical engineering once she graduates from Westview, a dream no doubt encouraged by her participation in FRC. During our discussion, we couldn’t resist asking what real-world problem she would most like to solve with robotics. “Transportation!” she responded enthusiastically. Living in a big city has clearly inspired her. Seeing the success of Team 746 and the pride the students felt for their robot’s achievements highlighted the importance of engaging young people like Ibty in STEM fields. FRC demonstrates that hands-on learning can be fun and the impact that this has on teams is immeasurable. FIRST students come away from the program as future leaders: encouraged to imagine a better world and empowered to build it for themselves. This post was developed in collaboration with Microsoft Canada. Read more about the impact of FIRST Robotics Canada and how Microsoft is improving access to STEM education through their #DoMoreTogether campaign by checking out the story of Team 6514: ‘Bot Builders and STEM Legends.